It seems to me it’s rather easy to say something along the lines of “transformation by reduction” when referring to the wave of minimalism that engulfed the culture in the 1970’s and forever changed our definitions of art, music, and even beauty itself. In fact I summarize minimalism’s power in those simplistic terms often. It is, however, singularly more difficult to explain what that really means, and how it is that simplicity and repetition can affect our brains and emotions in such powerful ways. Lately I’ve been rereading what is one of my favorite treatises on modern art, a sort of modern art apologetics if you will, Pictures of Nothing, an AW Mellon Lectures volume, compiled from talks given by Kirk Varnedoe at the National Gallery of Art in Washington in 2003. It’s a defense, in a way, of modern, abstract art since the time of Pollock, and Varnedoe treads waist-deep into the incredibly difficult terrain of defending modern artists and their “pictures of nothing.” It’s a lucid, wholly unpretentious accounting of the artists and their motivations, which have come to compose our modern art history, and Varnedoe is one of those arts world people who invites people in, instead of locking them out. Varnedoe’s arguments pushed me back towards the place in my head from which I initially determined I would write about art, in which I would refuse to let the traditional critical dialogues be sufficient and would instead, strive always for an analysis, or an argument, which would make the most sense, to the most people, when writing about a subject. In other words, I would eschew dense art-speak and write for more than the .005 percent of the population who can (or want to) decipher it. The old, transformation by reduction line, in defense of highly simplistic shapes or repetitive notes in music, is a great example. The idea, in a very general sense, is that by cutting away all excess, anything that could be construed as a distraction from the essence, an artist can create for his viewers or listeners, an environment in which they can rediscover the beauty inherent in, for example, a square, or, if we’re using the music metaphor, an F-sharp, in a way that is impossible when the note is surrounded by hundreds of others. The assertion being that silence in music, or space in art, allows the mind to more easily process a visual or auditory moment. But that doesn’t explain, really, how it is an art object or piece of music that is seemingly so simple, can affect our brain in such powerful ways. A couple of ramblings on why I think that might be the case now follow. Part of it is, for me, the intimate connection we feel to the music or art as the artistic representation of our time. For me, it has always seemed like the music of Phillip Glass or Steve Reich, for example, was my music. Not mine in the sense of me personally, but mine in the sense of my generation’s. Now part of that is certainly indebted to the fact that I grew up with the music. It wasn’t shocking as it may have been to those who knew life before it. 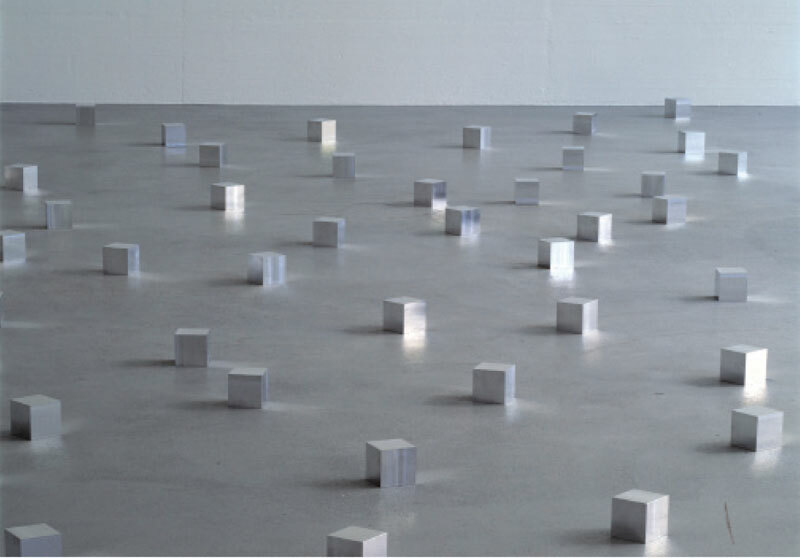 The same could be said for Carl Andre’s floor pieces. But the fact remains that a minimalistic bent in art and music, makes sense to me (us), it seems to be the art of the present. Our present. And as such, we feel a powerful connection to it. Historical forms of art, or music, are exactly that, historical, and despite the fact that many of them incontestably maintain some of the same intensity and inner energy they must have possessed when they were created, the connection we have to our music is necessarily different. There are two ways you can take this, first of all, it could be a chicken vs. egg thing. Do we feel a connection to the music simply because it is our contemporary and it is inherent to human nature to feel connected to something you associate with certain aspects of your life, or do we feel a connection to the music for a deeper reason? For the latter, in other words, do we feel a connection to this new kind of art because the language it is speaking, is directly related to our language, our internal language or philosophy, specifically? Of course, really, you could postulate even further, concerning whether the art’s language defined our cultural language as a whole, or whether it was influenced by cultural history. Everything is a factor of everything else and I’m not a philosopher so won’t make an attempt at answering the question. Not quite ready for that. Suffice to say, I posit modern music/art’s appeal is directly related to its contemporaneity with us as its audience. 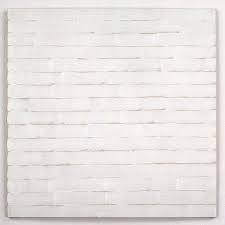 Varnedoe, in another possible defense, writes of the art of the minimalists, take Robert Ryman for an example, and makes the not immediately obvious observation that “you can’t hang them next to anything else.” Like I said, not immediately obvious, but allow me to explain. Picture yourself in a room with six paintings by Picasso, or Francisco Goya and hanging in the midst of the exquisite paintings of either master, is a Robert Ryman. A white canvas which reveals nothing more than white until it is examined closer. Upon which painting does your eye rest? Everything else is destroyed in the wake of the work of Judd, or Ryman, or the music of Glass, or Adams. It almost seems like, for a beginner, it would be so much easier to understand the power of minimal art, if that very thing happened. If instead of walking into a room, like I recently did for Carl André’s retrospective at Dia:Beacon, and encountering work after work on the floor, one were to walk into a room full of figurative paintings and one André floor piece. The powerful statement of the work would make more sense wouldn’t it? Of course art exhibitions aren’t designed for entry-level arts enthusiasts, but that’s a conversation for another day. The work, in the rather uncommon context I described above, would make you stop and think. You’d ask yourself why, and, unless you’re an incurably, uncurious person, you’d wonder why it’s there, how it got to be there and what it means. It’s involvement with you as the spectator would be “immediate” in the words of Varnedoe. In other words, you wouldn’t have to get up close and personal with the work to see what it included. It’s right there, all laid out for you. In this case, your gut reaction, of surprise, or immediacy, would be correct. In all honesty, you don’t really have to engage with it any further. You’ve already grasped its meaning. And there-in lies its power. 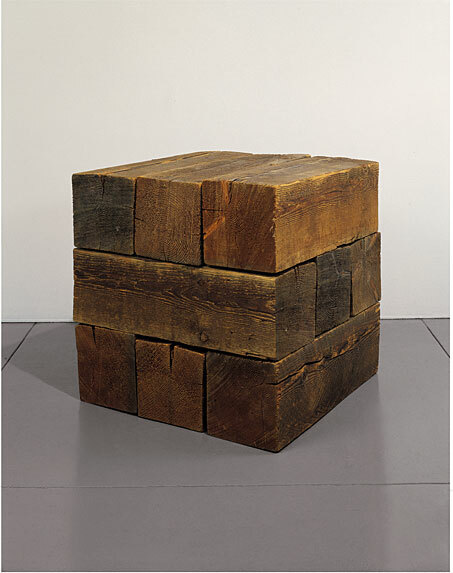 André, Judd, Cage, Reich, they all wanted their viewers or listeners to examine the idea of experience. They saw their work as an experimental departure, which is why context, in art, is often key, much of the work on view at spaces and museums of canonical artists like Judd and André, was never intended to be seen. We value it now from an art historical standpoint as we tell the story of how an important artist becomes an important artist. But even apart from that, much of André’s work, even the completed work, was still simply an experiment. I could go on forever. Part of the appeal for me, specifically as it concerns visual art, is the minimalist’s penchant for creating useful art, entailing a strong belief in the power of design and simplicity, to better our lives. Something I believe in wholeheartedly, and another aspect of this movement that is worth exploring in more detail. It’s easy to say good design betters lives, much harder to actually explain how/why in an empirical sense. I’ve got to stop there though. In summation? Art of one’s time is powerful. The most powerful. And minimalism’s power lies in its simplicity, especially when confronted in the context of traditional, historical art. You can’t look at anything else. And that’s all that needs to be said.